As a parent you naturally want to make choices that will have a positive effect on your child. 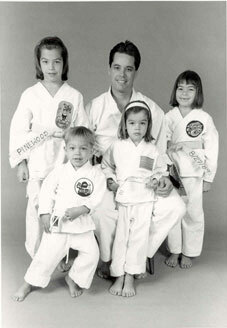 Training at Pinewood Karate is an excellent way for your child to "grow up safe and strong". But there are many more reasons for your child to train at Pinewood in addition to learning self defense. Pinewood karate is an excellent way to maintain good physical health. Children who train in Pinewood must be physically active. This will lead to increased strength and improved flexibility. Pinewood Karate requires focus which can increase mental concentration and help with school performance. Pinewood has a very detailed set of values which are practiced. (see our values page) These values will help your child to develop self-discipline and to learn respect for to others. Training at Pinewood Karate builds confidence and improves self esteem. Best of all, Pinewood Karate is fun! Please visit our dojo for a free tour today.